You’re already a step ahead of the game if you have or are looking for an industrial fan in your customer’s facility. The most important question to ask yourself now is how to choose the right fan for that facility. If you’ve yet to venture into the realm of HVLS — high volume, low speed —solutions, don’t worry because you’re not alone. In fact, the industrial fan industry as a whole is less than 20 years old but gaining increasing awareness — largely because industrial fans are providing cost effective and energy efficient solutions to major workplace environments and solving quality control challenges facing a variety of industries. Whether your customer runs a dairy farm or a retail store, a brewery or a distribution center, industrial fans are being recognized as effective tools in managing indoor air quality. in a way that truly “clears the air” in any facility — enabling HVACR systems to operate more efficiently while also optimizing employee comfort and health in unconditioned environments. While some of the key differentiators between an HVLS fan versus traditional high-speed fan options include reduced noise and minimized energy consumption per square foot, the major difference is enhanced coverage area and efficiency. Designed with longer blade lengths than conventional fans, HVLS fans have wingspans that can range from seven to 24 feet and move large volumes of air with minimized energy consumption per square foot. In fact, one HVLS fan can replace as many as ten to 20 floor fans or 12 48-inch barrel fans, effectively creating a 10 to 12-degree temperature difference in the warmer summer months. Equally as important to the summer months are the winter months. In the winter, buildings with high ceilings often experience significant heat stratification where warmer air rises to the ceiling while cooler air remains at floor level. This phenomenon forces a facility’s heaters to work two to three times harder to keep employees and building occupants adequately warm, while most of the heat continues to be trapped above their heads. It’s been estimated that air temperature can increase 0.5-1.5 degrees Fahrenheit per foot in ceiling height — meaning that if it’s 65 degrees on the floor, it could be 85-90 degrees at the roofline. HVLS fans, however, can essentially stir the pot, circulating air so that warm air trapped at ceiling level is cycled down to the floor. This allows HVACR systems to work more efficiently and effectively, potentially saving up to 30 percent on heating costs and translating into reduced operation costs of about $1 per day. However, not all fans are created equal. 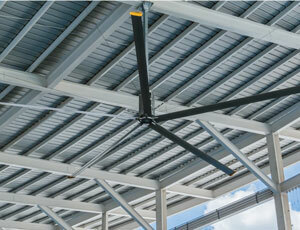 HVLS fans have plenty to offer, from their cost and energy efficiency to their low-maintenance and easy installation. Due to more efficient motors, fewer blades for less stress-inducing torque and airfoils designed to reduce drag while improving performance, HVLS fans are 50 percent more energy efficient than competitors. Additionally, they are simple to install. In fact, some fans are pre-installed, and they come to you with pre-installed bolts, prewired down rods and pre-aligned mounting brackets. HVLS fans are not only easy to assemble and operate, but they also contribute to workforce safety. HVLS fans’ cordless design allows for a safer industrial environment, eliminating trip hazards — an important factor considering many plant and facility managers identify cords as one of the top workplace hazards. In fact, the overall direct interaction between an employee and a fan is virtually eliminated with many HVLS models. This feature is compounded by the maintenance-free aspect of those HVLS fans with direct drive motors, which also eliminate the risk of oil leaks posed by traditional gearbox motors. Another important factor to consider is indoor air quality. Indoor air quality has been directly linked to the health of a building’s occupants. Poor air quality —which includes an excess of hot or cold air, indoor pollutants and stagnant air — can cause labored breathing and illness in employees while also posing product quality control risks, such as condensation build up and spoilage. With proper air circulation provided by HVLS fans, these air quality concerns can be eliminated — and HVLS installations are particularly adept in this area due to their ability to move large volumes of air with minimal energy. By consistently providing large-scale airflow, HVLS fans regulate a facility’s temperature while preventing stagnant air and a dust-riddled environment. High air turns also eliminate toxic airborne chemicals at a much more rapid pace. In addition to pollutants, HVLS fans can also control a facility’s moisture — specifically where it relates to condensation, which can form on the floor in between two different climate-controlled environments and present a significant safety hazard. Proper indoor air movement quickly dries this condensation to reduce fall risks as well as pollutants and bacteria associated with unchecked moisture. When thinking about the productivity of your workforce, one question is often overlooked — Have you created a comfortable environment for your employees? Comfort, while frequently downplayed, can be a critical factor in communicating that you value your employees’ health and their workplace experiences, while providing an optimal environment that feeds productivity. A plant’s air quality is one of the leading contributors to workforce comfort, because there is nothing quite so pervasive as the air employees breathe, live and work in on a daily basis. By creating a more comfortable, healthier work environment, we have seen companies experience reduced absenteeism and employee complaints coupled with boosts in overall productivity. Numerous studies have drawn the link between indoor air quality/temperature and productivity. In one instance, a warehouse customer in the Nashville region had initially been relying on several pedestal fans to cool down their work environment during the brutal Tennessee summer — a method that only provided relief for those working within the fans’ immediate vicinity. As a result, a facility manager fell sick from the heat and was not able to return to work, and the facility itself was forced to close its doors during the hottest portion of the summer. With these coverage area challenges in mind, we installed two 14-foot HVLS fans, which generate a consistent breeze throughout the warehouse, and the managers, and their team took immediate notice of all the differences in temperature. Since then, the warehouse has remained open all year-long with an uninterrupted rate of productivity, and the workers have indicated the warehouse can actually be a more enjoyable environment that other sectors of the facility than are air conditioned. Regardless of the industry, success is ultimately built off the safety and health of the workplace. Managing your customer’s indoor air quality is one of the first — and most impactful — steps you can take to ensure workplace safety and overall employee comfort but choosing the right HVLS solution is crucial to the success of this step. At the end of the day, HVLS fans are the comprehensive solution to improve workforce health and safety conditions across the board and across industries. And that safety has been proven to be linked to the very air that employees breathe. The importance of a facility’s air circulation and air management can’t be underestimated, and investments in the right HVLS solution for your facility can make radical transformations in a company’s wellness standards while boosting its bottom line.